Melbourne’s Swanston Street: once upon a time you could drive down it, until last year when four new platform stops were built to make it easier for passengers to board trams. One would think these new obstructions to traffic would make it impossible for motorists to accidentally drive down the road, but it seems that the universe is quite capable of creating an even more clueless form of idiot. ‘Everyone do the Myki hunch’ – it’s the only way for a person of average height to read the touchscreen on the ticket machine. So why are the machines so bloody low? 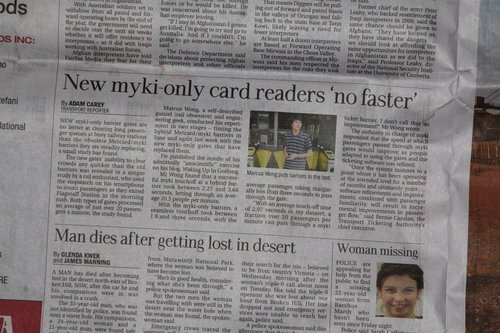 In case you didn’t notice it, yesterday I found my 15 minutes of fame when Tuesday’s blog post on the speed of Myki gates was picked by Melbourne newspaper The Age, and I did an short interview during the Drive show on ABC Radio 774. So how did it come about? How fast are Melbourne’s ticket gates? How many passengers per minute can a bank of Myki ticket gates process at a Melbourne railway station in morning peak? In the case of Flagstaff Station it doesn’t seem to be enough, and the reason might be the cycle time of the gates – but what about some hard data? 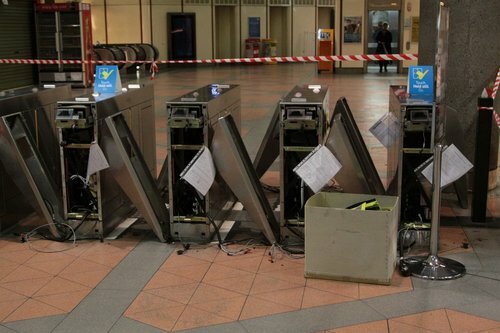 Myki gates: weren’t they supposed to be better? 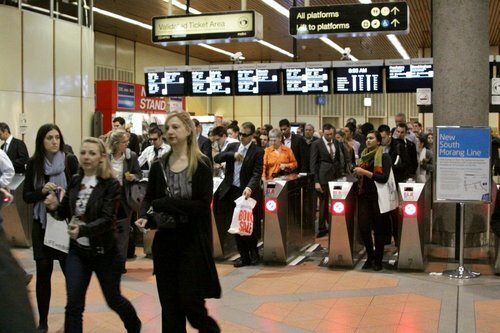 Myki: a few months ago the queues to exit Melbourne’s railway stations each morning grew to colossal lengths because of the exceeding slow ‘Frankbarriers’ that commuters needed to pass through. The solution promised to us was the rollout of proper Myki ticket barriers, but has it made any difference?